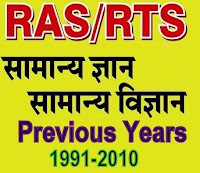 Rajasthan Admin Services (RAS/RTS) PRE Examination Solved Question Papers of year 2007 held on 23-12-2007 for General Knowledge(GK) and General Science. RasExam.com Tips: Supercomputer or Computer processors can NORMALLY access is 64 Bits. However, that depends what type of accessing you're talking about. There exist processors with 128-bit registers. But as on 2007, we believe normally 64-bit is used Now we think its 128 Bits. Discussion are welcome on this Question. Rasexam.com Tips: Formula of Temp. Conversion is (F-32)/9 = C/5, So as per Mathematical calculation, There are two temp. where F is twice to C .i.e. 180 F and -24 C So answer will be B as per calculation or -180 F.
RasExam.com Tips: A microgravity flame forms a sphere surrounding the wick. Diffusion feeds the flame with oxygen and allows carbon dioxide to move away from the point of combustion, so the rate of burning is slowed. The flame of a candle burned in microgravity is an almost invisible blue color. RasExam.com Tips: Watch video of Salawas on Youtube, Just to remember. sir ji salawas dhari udhyog दरी उद्योगke liye famous he jo yaha ki kumar jati कुम्हार ke log banate he.